It was first reported late last year that Samsung might introduce a 4K OLED laptop display at CES 2019. No announcement was made in Las Vegas but the wait is finally over. 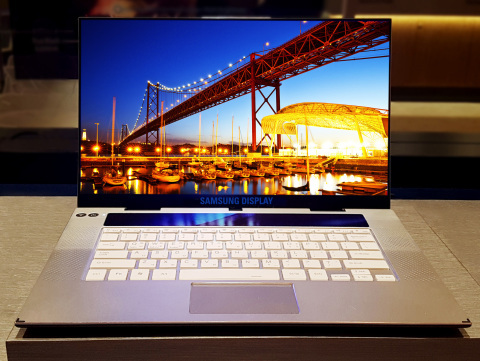 Samsung Display today announced that it has succeeded in making the world’s first 15.6-inch UHD OLED panel for laptops. It will be supplying this panel to leading manufacturers for their premium notebooks. The Korean conglomerate’s display business is no stranger to OLED panels. It has effectively cornered the market on mobile OLED displays. It’s now expanding into the notebook market. Samsung Display has nine production facilities worldwide and is a specialist manufacturer of high-quality displays. Samsung hasn’t said which manufacturers will be the first to use its 15.6-inch 4K OLED laptop display in their products. We can expect it to land on the premium models from the likes of Lenovo and Dell. Samsung says that it will start mass producing the panel by mid-February. So it’s going to take a couple of months before products with this panel arrive. Samsung may also use the panel in one of its own premium notebooks. The Galaxy Book is a 12 inch 2K AMOLED display. Is that difficult to turn that into a 15 inch 4K OLED display? I know it is only for demo purposes.